A Lucky 31 bet is one of the most popular multiple bets in the UK today. Bettors pick a number of different horses and then they make a series of different bets within one. Get 4 x Odds on 1 winner on Lucky 31 bets. T&C's apply. Lucky 31 bets seem to cause a bit of confusion among new punters, so what is a Lucky 31 bet? A Lucky 31 bet has 31-bets which are made from five selections in different events. These wagers include 5 singles, 10 trebles, 10 doubles, 5 four-folds, and an accumulator. When just one selection wins, the earnings get paid to quadruple the odds. If all of the selections win, a bonus is paid of 20% added to the total earnings. For this bonus to be paid, each selection must be a winner, meaning none void. If a Lucky 31 contains a non-runner no bonuses will be paid. The consolation will only collect on the win part of the best for each way bets. Lucky 31 bets are only accepted on horse and greyhound racing. Betfred bookmaker is always the best choice when it comes to having only one winner in Lucky 15, 31 or 63 bets and is clearly your No. 1 option for this. Who Pays the Best Odds on Only One Winner in a Lucky 31 Bet? 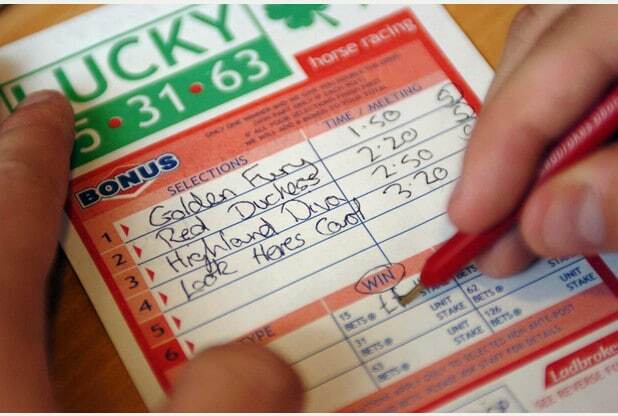 Winnings can be worked out by hand but using the lucky 31 bet calculator takes much less time. Working out how much you have won from a Lucky 31 bet has never been easier thanks to Lucky 31 bet calculator, it’s free to use and you can calculate your win or each way Lucky 31 bet returns. Have a go below and see how much you have or could win. When working out a lucky 31 bet any punter who hasn’t been shown the correct method will always work it out by computing all 31-bets separately and then tallying them together. This will seem outrageous once the correct method is known. The correct formula becomes much easier to understand once you see an illustration of a basic equation with its brackets multiplied out. This is a good example of the equation needed for a lucky 31 bet. As you can see there are five singles, 10-doubles, ten trebles, 5 four-fold accumulators, and one five-fold accumulator. The only problem is an addition +1 at the end that isn’t required. Therefore, in order to calculate a lucky 31 correctly all you need is the top equation and then minus one. Lucky 31 bet consists of five winning selections. You have bet 20 pounds on it, and the odds are 2, 2.5, 1.5, 3.2 and 4. Now assign one of these odds to one of the letters in the formula. This now looks very easy, and once you multiple these figures together you get £5886.8. You must now agree that this is much easier than working out each multiple separately. This equation is not just useful for working out Lucky 31 bets, with minor alterations it’s also a useful formula for all full cover wagers with singles.